Because I have seen many people asking about them so here they are: the rings. Made of fairtrade gold, they look rather simple and minimalistic. (Well, you don't need a ring competing with that stunning engagement ring is Stéphanie's case.) In close up, you can see that both their names and the date is engraved. The bridal bouquet, that was later offered to the statue of the Virgin Mary by the Hereditary Grand Duchess, was created by Parisian Maison Lachaume, Maître Fleuriste since 1845. The hair of new Hereditary Grand Duchess Stéphanie was done by Tom Marcineau of Maison CARITA, Paris. He also created the hairstyles for the Grand Duchess, Princess Alexandra, the other bridesmaid Antonia Hamilton and the hair of the female flower children. The hair of the other members of the Grand Ducal Family as well as other guests was done by Salons Alexandre de Paris, Decreton (Metz), as well as Luxembourg hairdresser Jeanne (Supplier of the Court) and Dessange. The Make Up of the bride, her mother-in-law and the bridesmaids was done by Belgium “master make-up artist” BOUZOUK. Other family members and guests were styled by Decreton (Metz) and Dessange. What kind of orchids were used in the bouquet? i have two question, one was there a number released of how many people worldwide watched the wedding, i know there was when Crown Princess Victoria got married in Sweden. And I was also wandering if Grand Duchess Josephine-Charlotte ever got to go to any of her grand children's wedding's? I noticed that Stephanie's wedding ring is on her left hand, while her engagement ring was on her right - perhaps because it wouldn't "get in the way" during the ceremony. There seem to be lots of different ways in Europe to wear rings - both on the left hand, both on the right, the wedding ring on the right and the engagement on the left (a la Mathilde) . . . ? Just curious. And for Adaralyn - GD Josephine-Charlotte died in 2005, so none of her grandchildren were married by then. Louis and Tessy were married in Sept. 2006 (that long ago!) and Marie Christine in 2008. Haven't heard anything about official numbers but maybe that will come later. Sadly not, Grand Duchess Josephine-Charlotte died in 2005. Prince Louis married in 2006, Archduchess Marie-Christine married in 2008 and Archduke Imre earlier this year. Her oldest grandchild, the Hereditary Grand Duke, was 24 when she died. LOVE!!!! I've never tackled a double wedding ring quilt, but I just might when you get the pattern together!!! Exciting!!! Useful information ..I am very happy to read this article..thanks for giving us this useful information. From another short article relating to the wedding bands, apparently Hereditary Grand Duchess Stephanie wore her own engagement ring on the right hand for the wedding, and her mother's engagement ring on her left hand, in honor of her mother who had just recently passed away a couple of weeks prior. It looked from the pictures I saw of both hands, that her mother's engagement ring fit the middle finger of Stephanie's left hand, leaving her left ring finger free to receive her gold wedding band. The thing I find intriguing in general in so many cases, is that the engagement rings for these royal young ladies, as well as one not so young in recent years, are created in white metals, like platinum, or 18kt white gold, while the wedding bands made for the ceremonies, and to wear henceforth, are made in yellow gold instead of matching the band to the engagement ring. There have of course been exceptions to the rule, but this seems to be the way they run in the majority. Mixed metal sets and coordinated e-rings and bands, while not "sets" per se, are quite fashionable right now, but didn't used to be until recently, and this has been going on since well before the current trend. I get the tradition established by Great Britain's Queen Mother for her wedding in 1923 when she had her wedding band made from a portion of a nugget of Welsh gold, presented as a gift from the Welsh mine to the Royal family. 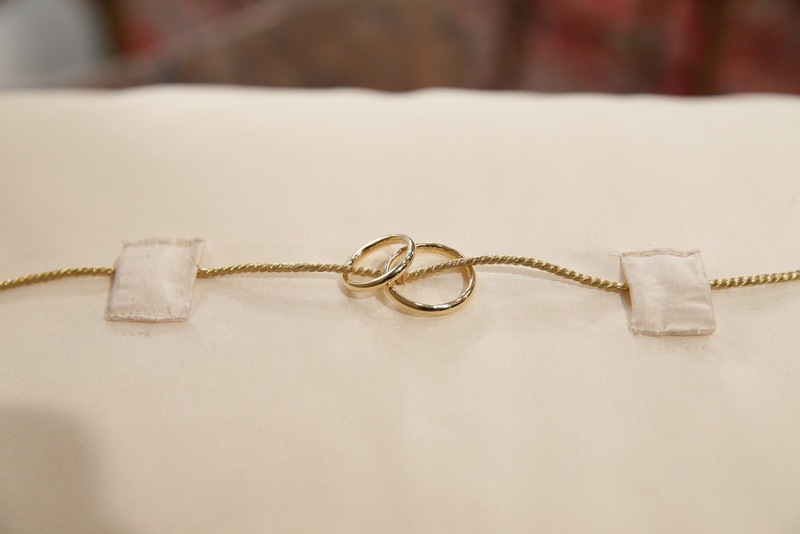 Wedding bands for Royal brides following her were made from the same nugget until it ran out sometime prior to Prince William's wedding to Catherine in 2011. A new nugget from the Clogau St. David mine in Wales had previously been presented to Queen Elizabeth II to replace the depleted original, and the Queen gave Prince William gold from the new one for his bride's wedding band. There's enough more to go round for future British royal brides, and grooms who choose the option to wear a band, like Prince Charles did for his 2nd wedding. According to the. Website for Clogau gold jewelery, "The gold that was used to make the wedding rings of Her Majesty The Queen, His Royal Highness The Prince of Wales, the late Diana Princess of Wales, Her Majesty Queen Elizabeth The Queen Mother and Her Royal Highness Princess Margaret all came from the famous Clogau St. David’s Gold Mine." Also, the wedding rings for the wedding of Sarah Ferguson, Duchess of York and Prince Andrew came from that original source as well, but for obvious reasons, isn't mentioned along with the rest. (At least, obvious to the rest, I suppose, due to their divorce, but they listed Diana's slender band even though she and Charles had split up, so what's the diff?) Camilla's band came from Welsh gold in 2005 also, but I'm not sure which source provided it ~ the old or the new. The mine is not producing its rare form of rosy gold any longer, so unless someone else discovers another source in Wales, what there is now is all there will be, and must be used judiciously. Eventually, Royal brides and grooms will need to establish a new tradition, but then that's how traditions come about! Someone has to be first.